Fiber to the home (FTTH), also referred to as fiber to the premises (FTTP), is the installation and deployment of a fiber optic network to individual homes and businesses to provide ultra high-speed internet access. The UK's existing broadband infrastructure is now much older than networks currently in use in other parts of Europe, where infrastructure has recently been installed, and the UK's current FTTH program is aimed at closing this "bandwidth gap". FTTH promises connection speeds of up to 100 megabits per second - 20 to 100 times faster than a typical DSL connection. However, implementing FTTH on such a large scale is a lengthy and costly process since it will require installation of a new cable network which will eventually reach every property across the country, generally following the routes of existing road networks. The total length of the UK road network was estimated in 2012 to be 245,400 miles (nearly 395,000 km). McNicholas Construction is one of the contractors involved in the early stages of FTTH deployment in the UK, beginning in the city of York. 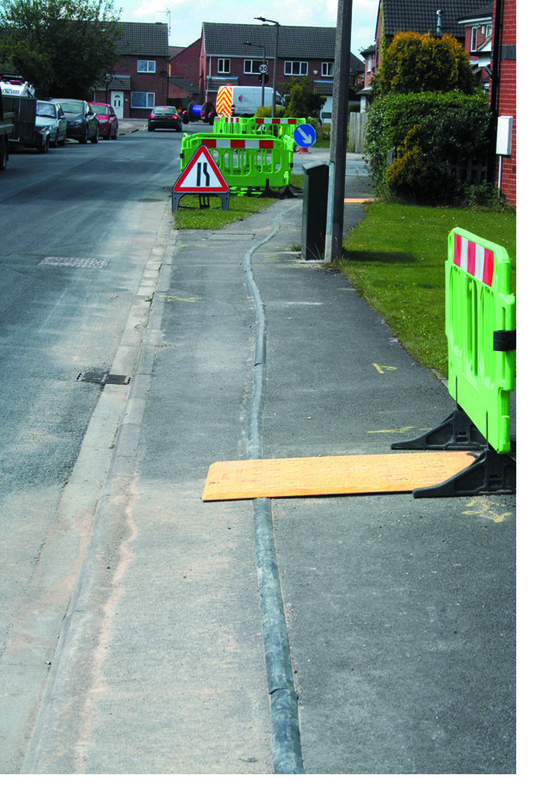 In order to increase the speed of the deployment, and hence reduce the overall cost, McNicholas Construction digs the trenches required to carry the new cables using a 'micro-trencher', a motorised rotary cutting disc, resulting in a narrow slit in the ground just wide enough to house the insulated cables. A micro-trench is typically between 30mm and 100mm wide, compared to a traditional 300mm wide hand-dug trench. This allows a micro-trencher with a small workforce to cover up to 500 meters per day, compared with 50 meters per day with more labour-intensive traditional methods. The micro-trenching method is not only much faster than traditional trench digging, but also greatly reduces the amount of excavated material and hence the amount of infill material required to reinstate the ground. A quick setting bitumen-concrete mix is poured into the trench up to the level of the ground which typically takes 48 hours to go off in a micro-trench, compared with 7 days for a traditional trench, thus minimising disruption to traffic and pedestrians. The trenching and reinstatement are carried out separately in two phases. During the interval between trenching and reinstatement, the open trenches pose a safety hazard to pedestrians and cyclists. Toes can catch the edge of the trench, while heels can get stuck leading to a potential fall and injury. 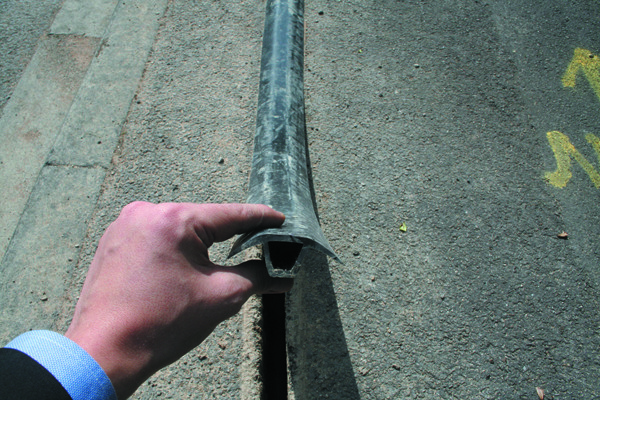 Bicycle wheels can also get stuck in the trench potentially dismounting the cyclist. When digging a traditional trench, the common approach to making them safe is to demarcate them with signage, traffic cones and amber lights, and place reinforced walk boards and pedestrian barriers across the trench at regular intervals where pedestrian access is required. However, these measures are costly in terms of labour, operations and upfront cost when deployed along significant lengths of road, and are excessive where the trench is only 30-100mm wide. Our solution was to design and develop an extruded profile which could sit on top of the trench and cover the edges on either side. The base of the profile therefore needed a protruding leg the same width of the trench to keep it in place, and a rounded top was required to span over the trench to allow pedestrians and cyclists to traverse safely across it. This reduces the need for pedestrian barriers, signage, walkboards etc. and the product is easy to install and remove. To reduce material costs, the protruding leg was made hollow and overall dimensions of the profile kept to a minimum. 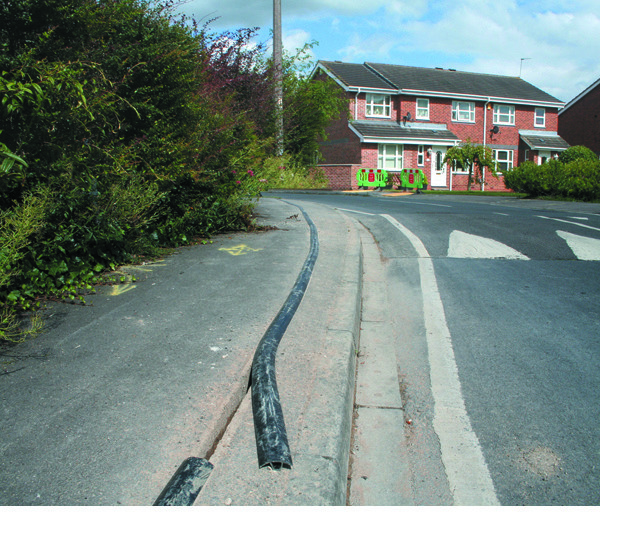 "We approached Duratex UK Rubber & Plastics Ltd because we needed a solution to cover our trenches during our fiber optic installations in York. We needed the solution to abate any safety risks posed to the public by an uncovered trench, whilst also being as low impact and as easy to install and remove as possible. We consulted Duratex who developed a custom solution which met all our criteria, and were able to produce the product within a short timeframe and at lower cost than other competing quotes we received. Their approach was the most practical in terms of our operations and allows us to cover ground quickly whilst minimising disruption to traffic and pedestrians during this phase of the project. Overall I was very impressed with their straight-forward attitude, reliability and professionalism. I would recommend Duratex UK Rubber & Plastics Ltd to other contractors in the utilities sector."